When I moved back to San Antonio from Colorado Springs, my kitchen evolved and no longer fit in the little pantry that came with the kitchen. Everything was crowded into the small shelving unit, and it was hard to keep track of what ingredients I had and what I needed. This little pantry seemed to be more suitable for my small appliances. 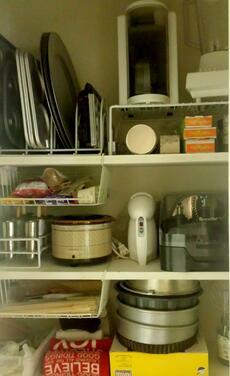 As for food storage, I decided to invest in a white baker’s rack, the beginning of my 5S kitchen. I pulled everything out of the pantry and put it instead on the baker’s rack; to help with straighten and sorting it’s best to have a clean shiny slate. Since I do quite a bit of baking, I had several jars that all look the same. These are good to have around, because I purchase my kitchen staples from the bulk section in the grocery store. I organize the bulk flours, dried beans, dried fruit, etc. into these jars, and label them clearly with my black marker, making sure there is no confusion. I love glass jars for the fact that you can run them through the dishwasher, and a simple black Sharpie marker will stay pretty nicely when you label the jars. You want to make sure that your food staples are clearly labeled; tapioca flour looks a lot like pastry flour. If any of my jars are full, and I still have some of my pantry staple left over, I put the “back stock” into large containers to hold the extra until needed. Once my back stock is gone, I add those items to my grocery list. To make it easier for me to find all of my ingredients, I put all of the “like” jars together and in alphabetical order, keeping it standardized. This is the easiest way for me to find everything quickly. To make it even easier, the spot is left for the jar that is being used and I simply return it when I’m done measuring out what I need. White is the standardized color for my new pantry, which also makes it easier for me to find everything. In these ways, my pantry system is sustainable. 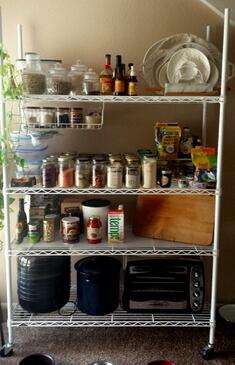 There are so many things you can do to have a Lean kitchen, and pantry organization is just the beginning. What have you done to 5S your own kitchen? Jacqueline Fonseca is a Process Improvement Coordinator at a healthcare center in San Antonio, Texas. When she is not working, Jacqueline is an Organizer for San Antonio Vegetable Eaters (SAVE), an active volunteer with “Green Space Alliance” and the “Society for Animal Rescue and Adoption." You can follow her on her blog The Compassionate Vegan, or on Twitter @compassionateve.